There is a theory in performance studies which states that the performance of emotion cannot exist without action. First theorised by Konstantin Stanislavski, the father of naturalism and method-acting, this system places the body as material, action as the live agent, and the performance of emotion as a by-product of action. In Stanislavski’s manual An Actor Prepares, he describes an exercise in which a teacher instructs a student to enact looking for a friend’s missing brooch, which has been lost in the folds of a curtain. When the student has performed the exercise with expected gusto and melodrama, he asks her to find the brooch he has actually pinned to the curtain. This time she sets to work with a slow, methodical approach and detailed gaze. It is then revealed that there was never really a brooch, only the students’ imagined belief of one - the lesson learned is that a truthful performance requires one to actually undertake the actions required of the imagined situation. Stanislavski writes: ‘you must not copy passions or copy types. You must live in the passions and in the types. Your acting of them must grow out of your living in them’ (1). From this, it can be extrapolated that performance is a system in which emotion is never the immediate aim, but the by-product of action. Just as in acting theory, the same applies to costume history and the role that clothes play in producing meaning. In this trio of articles, I will be looking at the ways in which the corset shaped the cultural perception of Victorian femininity. To clarify when I say ‘corset’, I am referring to the type of undergarment popular in the early to mid-Victorian era which spanned from the hips to bust, often with straps over the shoulders. Corsets were made from separate panels of fabric with triangular gores to smoothen and shape the hips and breasts. A broad busk (flat length of wood or steel) would be inserted up the centre front, with boning at the back, front, and sides (2). Much like the actor invokes emotion through action, the corset physically manifested abstract feminine qualities desired by the era. The boning created a structured hourglass shape, giving the body a refined, delicate, and meek quality, as well as accentuating the anatomical differences of the female body by drawing attention to the breasts and hips. The pressure exerted on the chest and diaphragm forced one to breathe from the upper part of the chest, making the wearer more prone to dizzy spells, fainting fits, and the ‘peculiarly feminine heaving of bosoms so lovingly described in popular novels’ (3). Thus, the corset not only enhances feminine qualities, but produces new ones which are then assimilated into society and mistaken as feminine. In this sense, Victorian femininity becomes a performance manufactured and continued by fashion. In the case of the corset, which literally shaped women’s bodies and restricted their movement, the perceived role of women was both produced by and made explicit through their clothes. Much as the actor signals emotion through action, the corset constructed a performance of femininity through the physical constraints it placed on the body. In this trio of articles, I will explore how the corset was used to shape the role of the Victorian woman, and how the garment gained a reputation of its own as both a symbol of feminine virtue and morality, and as a fetishised object and enabler of immorality. 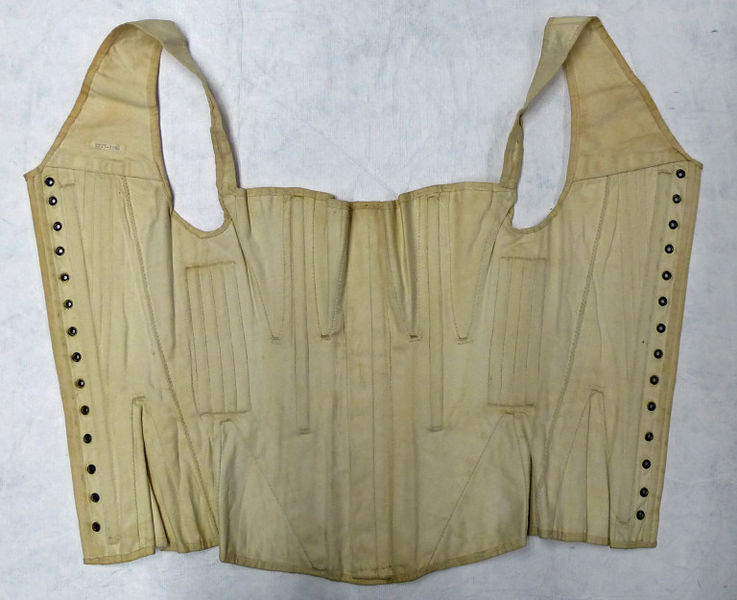 In the next article, I will be investigating how the corset was perceived as a regulating garment for the moral women.